Calisthenic routines - Part One -Bar Brothers Get Fit Easy! 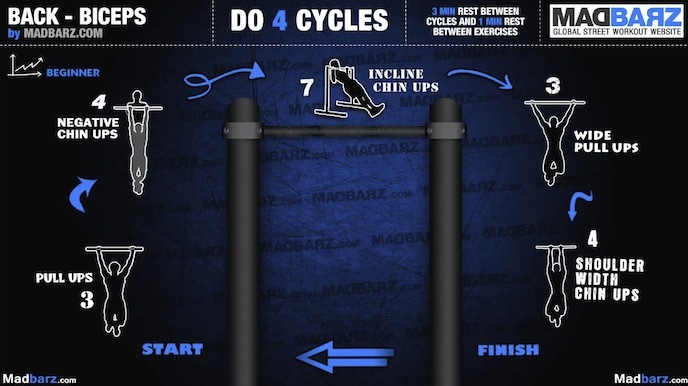 Today we will talk about some simple and basic calisthenic routines, they are all taken from madbarz, do not miss them. These routines are calisthenics, as many of you know, to do at home or in any public place with the necessary tools. First and in this article we will discuss calisthenic routines for beginners, so if you have not started yet this is the right place to start doing sport and achieve that physique that you miss and both want. Strengthen our arms and begin to do these are exercises that must be performed in 4 cycles, ie, once we finish rest and repeat 3 times.